Floods cannot be prevented, but with good strategic planning and management, loss of life can be avoided, and damage to property can be minimised. The key to minimising the impact of floods is preparation, and to that end, everyone has a role to play. The federal and state governments need to come up with comprehensive and executable plans based on lessons from past flooding events. So far, some states have been doing their part, for example, the Victorian Government launched its Floodplain Management Strategy to help communities prepare for future flooding events. Management strategies are created to ensure that communities know what measures to take while preparing for floods as well as what actions to take during actual flooding events. If everyone (including property owners, developers, local planning departments, and disaster relief personnel) adheres to the recommendations in the Floodplain Management Strategy, the loss of life and property could be avoided. What can we do to ensure we are prepared for future floods? As far as natural disasters go, floods are the most predictable, and thanks to modern technologies, we can model for floodwater depths, velocities, and pathways. In fact, flood models already exist for hundreds of catchment areas in Australia, and you can find them if you look up the SES flood emergency plans in your state. If you live, travel or work near a waterway and the relevant council has had flood plain mapping prepared you should be able to find it there. Yet some communities have greeted these models with scepticism. Some of the sceptics find the modeled consequence of floods too horrible to contemplate, but more commonly the predictions are ignored for financial reasons (they don’t want their property values to be affected by the publication of flood mitigation reports). Even some councils have been found to kowtow to this pressure and avoided doing what is in the best interests of it’s constituents out of fear of not being reelected. However these fears are ungrounded as property values continue to soar even when these models are released to the public. We should collectively look at what happened during past floods, and ask: What could we have done better? Include flood mitigation best practises into building codes for areas at risk of flooding. If not for its recently built levees, 80 per cent of St George would have gone under. How much does it cost to build a levee compared to restoring 80 % of a town? While levees are now under construction in some Queensland towns, that state still does not have a flood-plain management policy to discourage inappropriate development on flood plains, which is in sharp contrast to other states. Many years ago, there was a 2:2:1 funding arrangement between federal, state and local governments for flood mitigation works across Australia. That was changed to the system we have today of a 1:1:1 ratio, which increases the cost burden on local government, making it harder for many, particularly those in rural areas, to be able to afford to do anything. If you are a homeowner building your home in a risk area ask yourself this, wouldn’t you prefer one-off higher construction costs based on better design and materials than ongoing high insurance premiums and the risk that you may lose your possessions, the house itself or worse still lose the life of yourself or a loved one? And, as a taxpayer wouldn’t you rather your taxes were wisely spent on mitigating the impacts of disaster through education and well planned and executed design that could prevent a lot of the disastrous impacts rather than shouldering the cost of cleaning up and rebuilding infrastructure afterwards? If we ignore the lessons that we’ve learned from past floods, we are doomed to suffer similar (or worse) devastation in the future. The government (through the Weather Bureau) has worked hard to put in place early warning systems for floods. Unfortunately, flood forecasting isn’t always accurate. 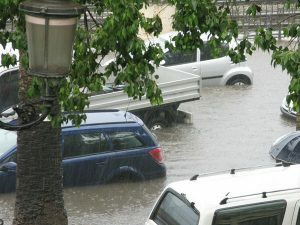 In some areas, floods may come in quicker than any systems can anticipate, while in others, the floods may not even rise to the predicted levels. The Weather Bureau puts out flood warnings early, even if they haven’t collected all the data, because if they wait too long, people won’t have enough time to evacuate. Even then, it’s wise to heed any flood warnings in your area and to take appropriate measures without any delays. Everyone needs to accept their local authorities recommendations on what to do to prepare for floods. More than half the lives lost in Australian floods over the last 50 years have been from people driving, walking or swimming in floodwaters. If you get a flood warning, spread it around because some of your neighbours may not have gotten it. If you live in or near the affected area, evacuate your family and get to higher ground (or to a designated flood relief zone) as fast as you can. It’s better to evacuate and find out later that it was a false alarm than to question the warning and end up putting your life at risk. This entry was posted in Disaster Management, Property, Story. Bookmark the permalink.